You can decrease the amount you use for each ingredient if you want to make less, but keep in mind that chili reheats and makes for great lunches or quick dinners. Plus you can freeze it and thaw it out for another time. This recipe is kind of like my kitchen legacy game. I am always adding new things or changing it in some way. For example, my brother-in-law requested a chili with no beans…so I added more ground chuck and nixed the beans. Sometimes I add more sugar and pumpkin pie spice for a sweeter chili. Other times I add more chili powder to give it a bit more oomph. Chili can be done so many ways, don’t be afraid to experiment with it! In a skillet over medium heat, brown the ground chuck, drain. Stir in onion, bell pepper and garlic. Cook five minutes. Pour the ground chuck mixture into the crock pot and add the kidney beans, tomatoes, chicken brother and pumpkin puree. Stir together. Slowly add the tomato juice until you reach your desired thickness. Turn crock pot on high and cook for 4 hours. Turn crock pot down to low or warm and let simmer. Serve and enjoy. 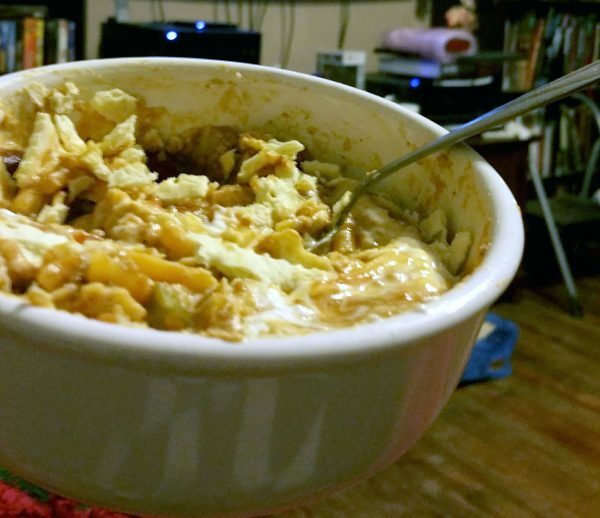 I like to mix my chili with sour cream, cheese and crackers! To make your own pumpkin puree: select a pumpkin of any size. Preferably a good sized pumpkin if you wish to yield more than one or two dishes from it. The puree freezes well and can be used over the year. Preheat the oven to 325 degrees. Cut the pumpkin in half from stem to base. Remove seeds and pulp. Cover each side with foil and bake for 1 hour or until tender. Scoop out the meat of the pumpkin and puree in a blender. Strain to remove any additional pulp. Puree can be stored in the freezer in freezer bags or plastic containers.